The waste dumped at a farm in Ha Tinh Province's Ky Anh Town is from Formosa Ha Tinh Steel Corp. (FHS), a local environment official confirmed. Head of the Department of Natural Resources and Environment in Ky Anh Town, Pham Van Hung, said that they had come to inspect the site following the news on DTiNews and found out that FHS has been dumping their construction waste here since 2013. "Our first testing showed that the black muddy waste was not toxic but there were toxic substances left in the used tanks," Hung added. "We plan to move the waste to a local company for treatment." Following reports from local people, DTiNews visited the two-hectare dump site in Trai Village, Ky Long Ward, some three kilometres from the FHS, yesterday to see different kinds of waste including used tanks, plastic bags, bricks and concrete, wooden and iron pieces, and black muddy waste. On the many iron and plastic tanks found here, there were letters written in both Chinese and Vietnamese which indicate toxic substances. Three letters F.H.S which is an abbreviation of Formosa Ha Tinh Steel Corp. were also seen on some pieces of waste. According to the owner of the farm, Cao Nhan, at the end of 2013, a foreign man came with his interpreter to ask for Nhan's permission to dump waste at his farm. Nhan agreed after seeing that he could reuse many items in their waste. "I don't know whether this is hazardous waste or not," Nhan said. "I can take the wooden pieces for fire, the tanks can also be reused." The farm owner also said that he didn't know about the amount of waste that has been discharged at his farm. 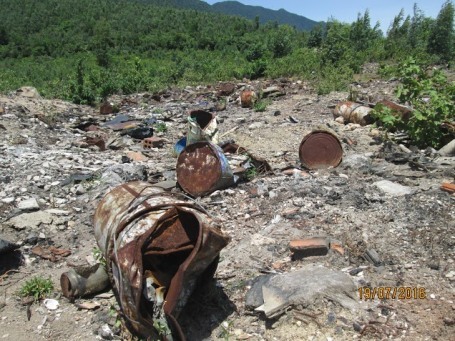 In early July, Ha Tinh’s environmental police uncovered around 100 tonnes of waste dumped at a private farm run by Le Quang Hoa, director of Urban Environment Company in Ky Anh town. Samples tested at the Institute of Technology and Environment showed that the waste was toxic. Hoa said the waste were from Formosa. In a letter sent on July 15 to many agencies including the Ministry of Natural Resources and Environment, the Ministry of Science and Technology, the Vietnam Academy of Science and Technology, Ha Tinh Province People's Committee, and the media, Formosa cited an article in its contract with the Urban Environment Company in Ky Anh Town saying the firm was responsible for transporting Formosa's muddy waste to a dump site approved by the Ha Tinh's Department of Natural Resources and Environment. The company also had sole responsibilty for the dumping process after taking waste out of Formosa Company. Formosa also said that they had dumping approval from Ha Tinh's Department of Natural Resources and Environment and tests showed their waste was not toxic.